This weekend will see the project’s first full performance. We will be playing as a small ensemble (5 players including computer/electronics), focussing on vocal parts, the gender – a set of bronze keys placed over resonators and played with soft mallets, and a variety of small kettle gongs I picked up at and antique market during recent trips to Solo. The programme will consist of new arrangements of traditional pieces, ranging from sparse accompaniment of sung poetry (macapat) to stretched out versions of gong cycles based on old ceremonial gamelan. The instruments are gathered from various sets allowing for subtle play on differences in tuning and beating tones to be extended and manipulated with the computer. 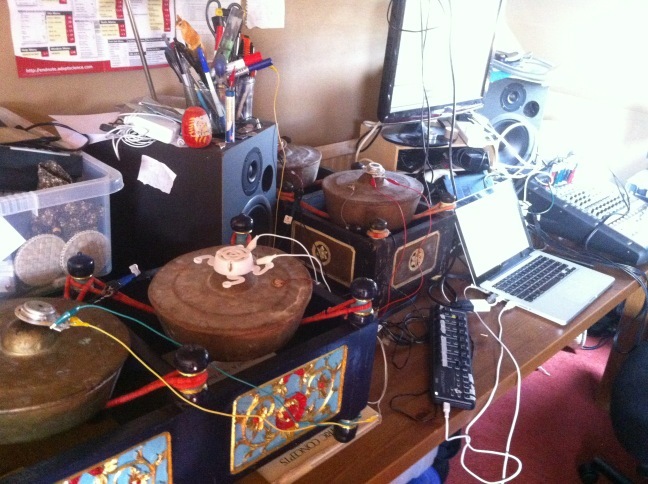 In some cases the computer will play the sounds through transducers attached directly to the instruments, essentially turning them into very resonant speakers. This performance has been some time in the making and brings together ideas that I have been working on with various people both here and in Java. Hopefully this will be the starting point for a lot more collaboration! The event will take place at the Union Chapel as part of their Daylight Music series, Saturday 30th of June. The event is free and runs from 12 noon until 2pm. Other artists appearing are Dan Amor and The Sea & I. This project was developed at the ADRI, Middlesex University with funding from the Arts and Humanities Research Council (AHRC).